Spring is definitely here in the bird world. As I walk out to the wetlands the sounds of Redwing blackbirds, Western meadowlarks, Song sparrows, and lots of wild turkeys fill the air. As I look ahead to the west there is a large flock of mixed turkeys, males and females moving along in a line eating. They are being very noisy, communicating with each other. This is a socially complex bird, with a broad array of vocal signals. A non-migratory species, most travel and movement is conducted on foot, although the species is a strong short-distance flier. Wild Turkeys roost in trees at night and spend most daylight hours on the ground.Turkeys are very vigilant creatures. Living in a group puts more eyes on potential threats, and they will scatter at the slightest indication of danger. A turkey’s gender can be determined from its droppings–a male’s will be shaped like the letter J, a female’s more spiral-shaped. their favorite food is acorns though they are omnivores and will eat any thing that is moving in front of them from grasshoppers, snails,berries, grasses, and bulbs, to lizards and snakes. This actually has caused some concern about their impact on the native populations of wildlife and plants. According the Scientific American article by Dawn Starin from March 8, 2016; ” According to Christina Donehower, an environmental scientist at the Natural Resources Division, California Department of Parks and Recreation, much of the long-term data needed to reliably answer these questions and guide management actions is lacking. Donehower explains, “It is very likely that wild turkeys are affecting the ecological communities that they have come to inhabit in California. 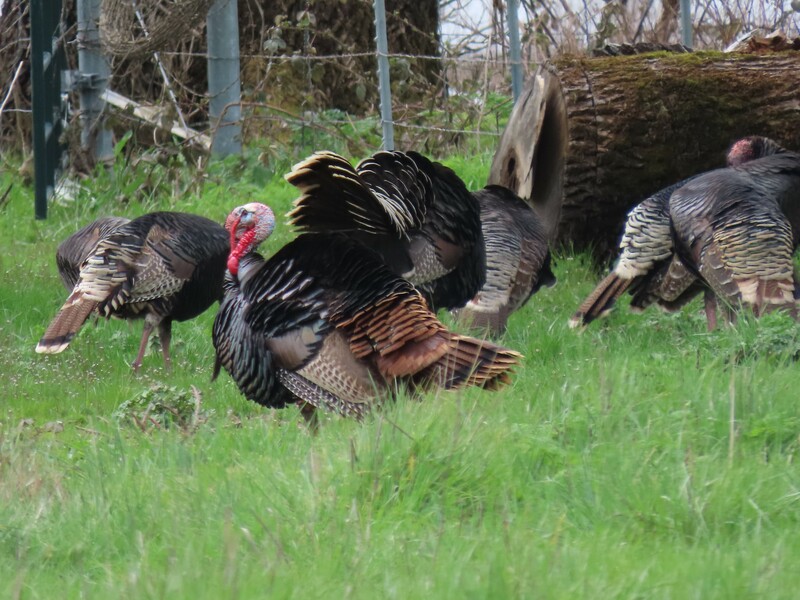 However, at this time, State Parks has limited capacity to devote to the monitoring and management of turkeys.” And so far, she says turkeys in California have received relatively little attention from the scientific community….Concerns about the turkey’s potential impact on the native flora and fauna were being raised by both government agencies and the public in the early 1990’s…In 2007, the California State Department of Parks and Recreation identified three potential negative environmental impacts of turkeys as being of immediate importance: their consumption of endangered reptiles and amphibians, their competition with ground-dwelling birds for resources and their contribution to the spread of a tree disease called sudden oak death. 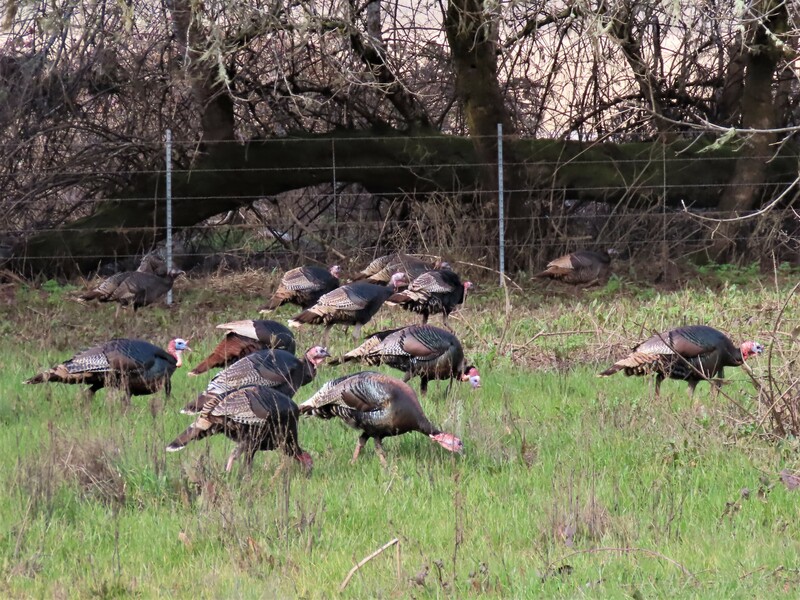 Also in 2007, the Laguna Santa Rosa Watershed suggested that the effects of the wild turkeys on oak recruitment, soil disturbance, and damage to sensitive native species should be investigated.” There are 5 subspecies of the Wild turkey, Meleagris gallopavo, and ours came from the Rio Grande area so is the M.gallopavo intermedia. 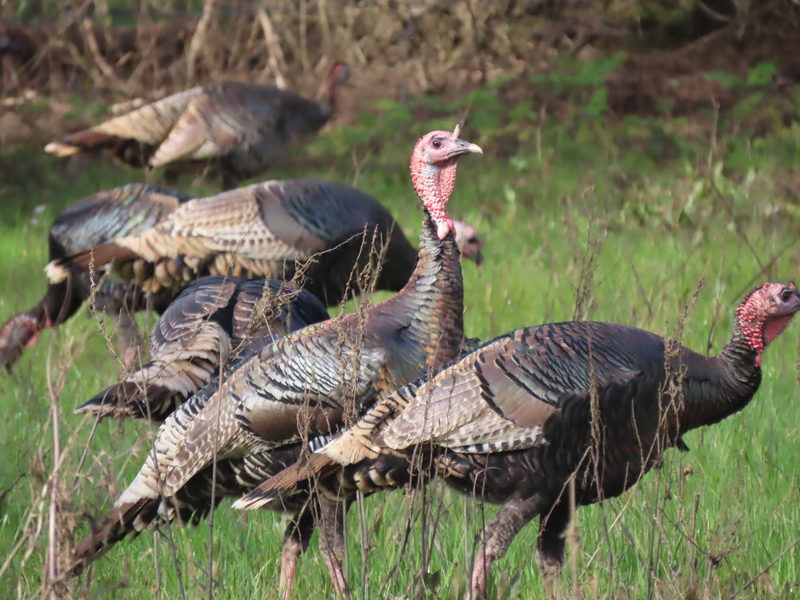 The Wild turkey is now found in 50 states. Watching this large group of sizable birds I have no doubt they are having a significant impact on this habitat! The hens lay 10 to 18 eggs in a shallow nest on the ground, sitting for 25 to 31 days. It does seem that each year in this valley there are more of them. Wild Turkeys are hunted by coyotes, bobcats, raccoons, mountain lions, Golden Eagles, Great Horned Owls, and people. Nest predators include raccoons, opossums, striped skunks, birds, such as crows and jays, and rodents. In this valley we have all of these predators. It is surprising that the population of Wild turkeys keeps increasing. They begin to gobble loudly and put on a display for the hens. What a glamorous show as the males strut around with their tails fanned out. 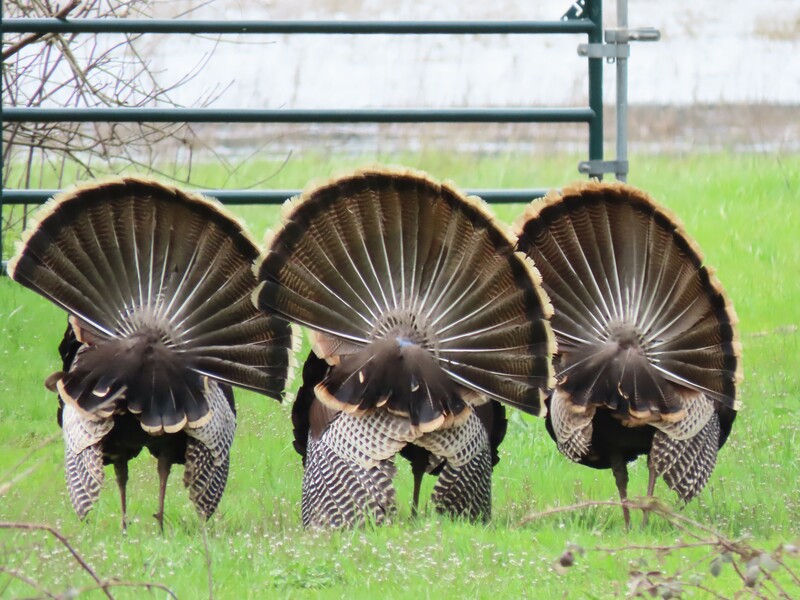 I leave quietly so asto not to disturb this grand dance of turkeys.